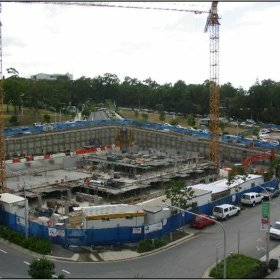 Kelvin Grove Urban Village is located approximately 2km from Brisbane’s CBD. This development is being created on 16 hectares of land in the suburb of Kelvin Grove on the site of a disused army barracks. The Village centre is set to become a revitalised residential, education and shopping hub. This project consists of 4 buildings incorporating; 213 apartments with one, two and three bedroom apartments. 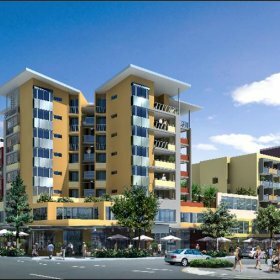 These apartments will be built over a retail/commercial centre with a major supermarket, restaurants and café precinct and other specialty shops. The construction of the buildings is reinforced and pre stressed concrete with reinforced concrete and masonry load bearing walls. The basement is approximately 9 metres below surface level. Six hundred mm diameter reinforced bored soldier pile were used at 2.5 metre spacings with rock anchors to restrain the excavation and maintain stability to the adjoining buildings and footpaths. Ultimately, they support major building loads. The building contains 3 levels of car parking, retail areas, a podium level transfer at level 3 and up to 7 storeys of units over. The transfer slabs at level 3 spans 17m over the retail loading dock. A 3.5m cantilever steel awning covers the perimeter of the building at street level.